Tony Bennett sings with some of today's greatest artists on Blu-ray next month. In an early announcement to retailers, Sony Music is prepping 'Tony Bennett: Duets II - The Great Performances' for a high-definition release on March 6. 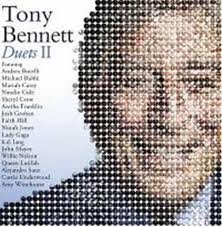 'Duets II: The Great Performances' is a visually stunning video companion to Tony Bennett's history-making #1 album, Duets II. The Blu-Ray features the full song performances from Tony and today's greatest artists as they were recorded live in the studio. The musical segments are enhanced by insights on the process from Tony and the duet partners, providing an inside look at this landmark album in an unprecedented career. 'Duets II: The Great Performances' is a testament to the artistry and dedication of Tony Bennett, beloved by the performers who sing with him and audiences around the world. You can find the latest specs for 'Tony Bennett: Duets II - The Great Performances' linked from our Blu-ray Release Schedule, where it's indexed under March 6.